Wilson Ramos was confident he wouldn't need to go on the disabled list. A baseball season is filled with tough losses, but last night's walk-off to the Nationals felt different from the rest. The Phillies were one out away from a big win, which would have denied the Braves the chance to pad their division lead. But then it all fell apart. Seranthony Dominguez gave up a double and then a homer. The Phillies lost their fourth straight game. They trail the Braves by three. It's almost September, and the Phillies have to recover quickly or else it could all be over. Wilson Ramos, center, expects to be back in the Phillies lineup on Friday. Wilson Ramos took a train back to Washington on Wednesday afternoon with good news. The tests he underwent earlier in Philadelphia did not reveal any damage to his left wrist, which had been sore since it was struck by Jake Arrieta's 95-mph sinker during Saturday's defeat. 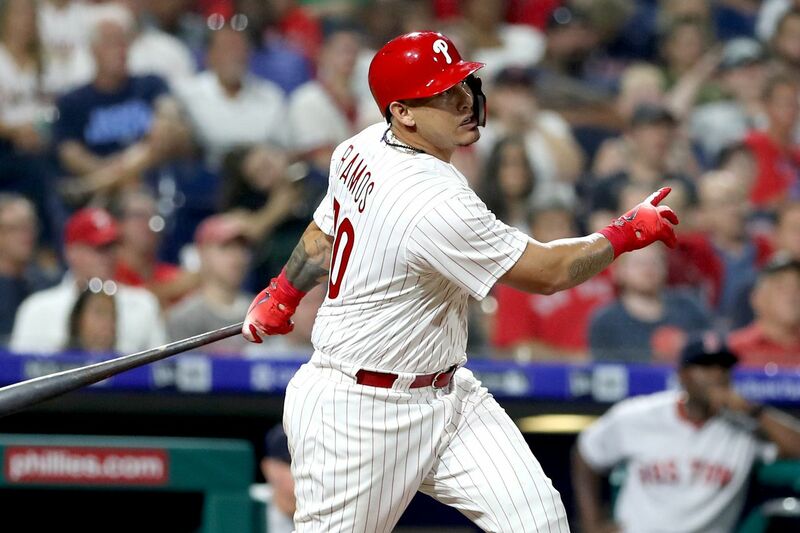 Ramos, after a brutal loss to the Nationals, provided some hope for the Phillies when he said he was confident he will not need to be placed on the disabled list. "Probably, I will be ready to play on Friday," Ramos said. "I'm on the bench available for any situation that the manager needs me. I know he'll take care of me. I have to be ready." Ramos took batting practice when he rejoined the team Wednesday at Nationals Park. He still felt sore, but he said he can play through the pain. He said he felt discomfort Sunday night when he was batting during the team's game in Williamsport, Pa. The pain stemmed from a day earlier when he and Arrieta got their signals crossed while Ramos was catching. "That was my fault," Arrieta said Saturday. "We had a sequence that we established beforehand. I don't want to give too much away, but it was supposed to go in a different route. I was on a different page than he was. That was on me. It doesn't really have anything to do with working together for the first time; it was just something where there was a little bit of a lapse there. I thought we were going in a different route, and he was actually correct." Gabe Kapler said he's not worried about his team after Wednesday night's crushing loss. Rhys Hoskins echoed the same belief. "There is no panic," Hoskins said. The Phillies have bounced back all season from rough spots, but today will be a challenge as they face Max Scherzer. Seranthony Dominguez has blown three saves this month as he has struggled more in August than he has in any month since he reached the majors. He seems to be showing signs of tiring out, but Dominguez insists he's fine. "I feel the same," he said. The Phillies made a trade Wednesday morning, as they acquired lefthanded reliever Luis Avilan from the White Sox. Avilan has been very good this season against lefthanded batters, and he gives the Phillies bullpen some lefthanded relief with Austin Davis and Aaron Loup on the disabled list. Avilan will join the Phillies today in D.C. Already looking ahead to 2019? You're in luck. Next season's schedule was released Wednesday. The Phillies will open 2019 at home against Atlanta and make visits during the season to American League cities such as Kansas City, Detroit, and Cleveland. Today: Aaron Nola vs. Max Scherzer, 1:05 p.m. Tomorrow: Jake Arrieta opens three-game series in Toronto, 7:07 p.m.
Saturday: Nick Pivetta faces the Blue Jays, 4:07 p.m.
Sunday: Vince Velasquez faces Marco Estrada in series finale, 1:07 p.m.
Phillies pitcher Aaron Nola will face Max Scherer this afternoon in what should be a pitching duel. Aaron Nola will make his 26th start of the season this afternoon when he faces Max Scherzer in a marquee pitching matchup at Nationals Park. Through 25 starts, Nola has a 2.24 ERA, , which is almost identical to the mark posted by Roy Halladay in his first 25 starts in 2010. Nola's mark, 2.236, is actually lower than Halladay's, 2.238. Nola had a 0.98 WHIP, struck out 25.4 percent of the batters he faced, and held opponents to a .541 OPS. Halladay had a 1.01 WHIP, struck out 22.9 percent of batters, and held opponents to a .616 OPS. Nola is missing only a perfect game. Question: Which two players are the most crucial in determining whether the Phillies remain in playoff contention and what is your most realistic outlook for them through September? – emailed question from Phil W.
Answer: To me, the two most crucial players are Odubel Herrera and Carlos Santana. You know what you have in Aaron Nola and Rhys Hoskins. You know that Asdrubal Cabrera will produce and that Wilson Ramos will be a threat as long as he's in the lineup. But you don't really know how Herrera and and Santana will play in the final weeks. That's what makes them crucial. If they produce, the Phillies lineup is a whole lot more threatening than it has been in August. If they don't, then Gabe Kapler is forced with the decision of whether to play Justin Bour and Roman Quinn over them, as he did Wednesday night. The way Herrera and Santana produce — and the way Kapler reacts if they don't — could provide the difference for the stretch run. My realistic outlook is that Herrera's struggles continue and Kapler is forced to play Quinn more. Santana continues to play for his defense, but Bour's bat keeps him in the lineup two or three times a week.